This volume grew out of a dissatisfaction with some issues that seem to be rooted in the Empiricist tradition. At least since Locke, that which is perceived has enjoyed a major share in any systematic account of what we claim to know. A main purpose of this study therefore is first to distinguish, and subsequently to relate, what can be perceived and what can be under- stood. 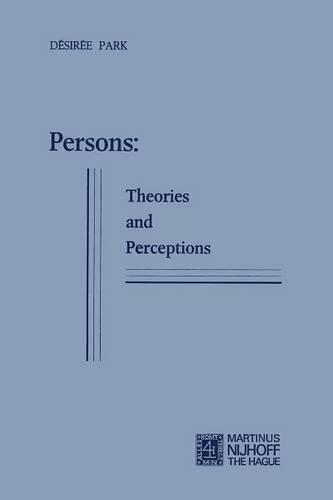 To this end, the account of persons and personal identity begins with a description of selected types of sense perceptions. While writing a good part of the discussion on vision, I had the advantage of questioning Dr. P. B. Loder about the properties of light. She not only clarified some issues, but prevented several errors from creeping into the text, a result for which I am very grateful. I should like also to express my appreciation to Mrs. G. K. Stamm-Okkinga, who provided hospitality and a friendly interest from the beginning of this study. Finally I wish to thank Miss I. Ris and Mr. W. de Regt for their careful and resourceful preparation of the typescript.